The Center for Cartoon Studies has announced a major project that partners them with another major White River Junction institution, the Veteran’s Affairs Medical Center. Later this month, they’ll be working on a major event with veterans and storytelling. Many veterans pass through this small New England village because it is home to The White River Junction VA Medical Center. White River Junction is also the headquarters of The Center for Cartoon Studies (CCS), a world-renowned cartooning school. Until recently, these two very different institutions never crossed paths. 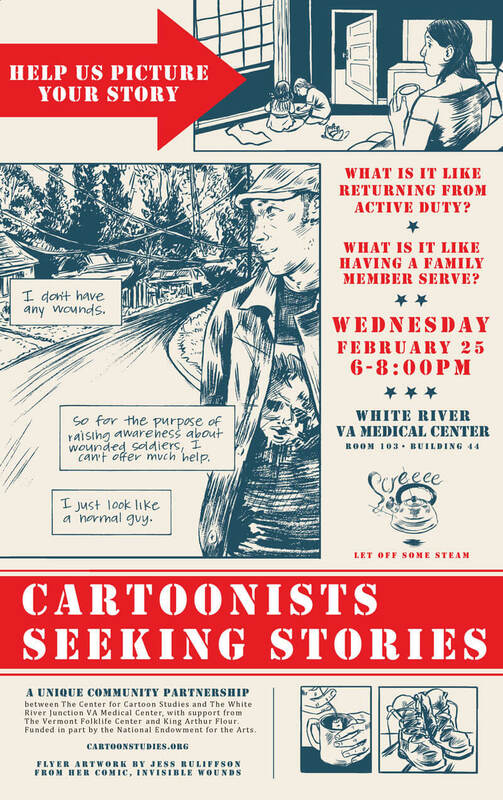 On Wednesday, February 25 from 6-8pm at The White River Junction VA Medical Center in Building 44, Room 103, cartoonists have invited veterans and their families to learn about cartooning and share their stories with the intention of turning those stories into comics. Students and faculty from The Center for Cartoon Studies will be on hand as well as Brooklyn cartoonist Jess Ruliffson whose award-winning comic Invisible Wounds examines a vet’s experience with PTSD. No R.S.V.P. required. Brattleboro, VT resident Christie Turner is one veteran who will be there. “I vowed that if I got out of Afghanistan alive I would tell the stories of the young military men and women who have served in Afghanistan and Iraq. I want the mothers and fathers of our soldiers to know what their children did and do in the service of their country. I want the people with no connection to a service person to hear the stories and think about what we as a nation demand of the military services. Comics are one way to share our experiences, ” says Turner. The Cartoonist Veteran Project is funded in part with support from The National Endowment for the Arts. This looks like it’ll be an astounding event, and an excellent way to help veterans struggling to reintegrate into society.